The following review appeared on the Blues Art Studio website. 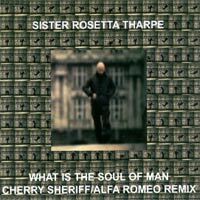 This is the remixed version by one Cherry Sheriff of the 1944 recording made by the legendary ((but sometimes forgotten) Gospel Blues Shouter and guitarist Sister Rosetta Tharpe; as used in the recent advert for Alfa Romeo cars. Go out and buy it now! Send it, to the top of the charts!